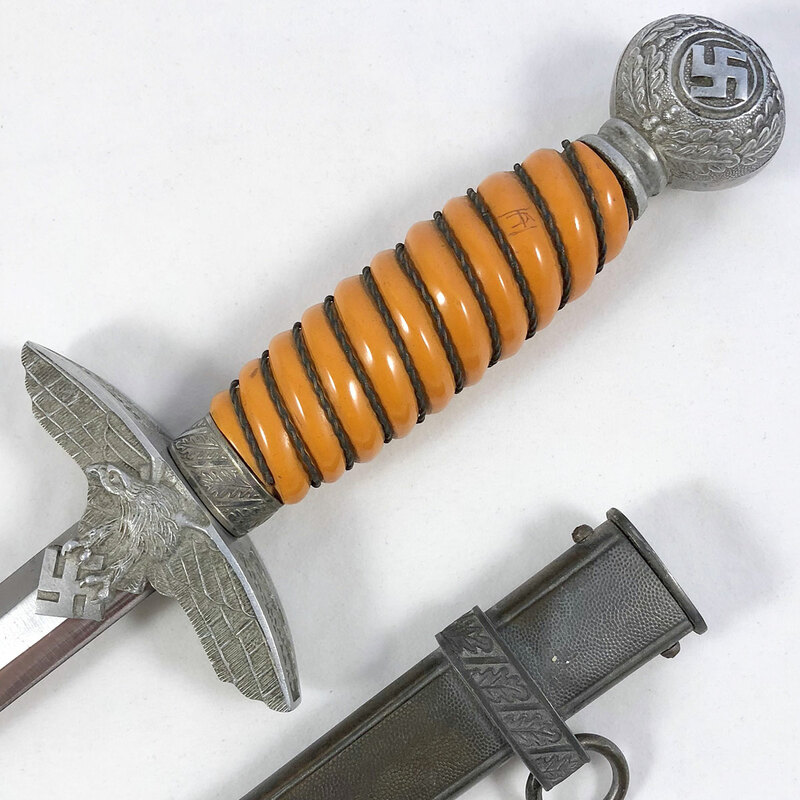 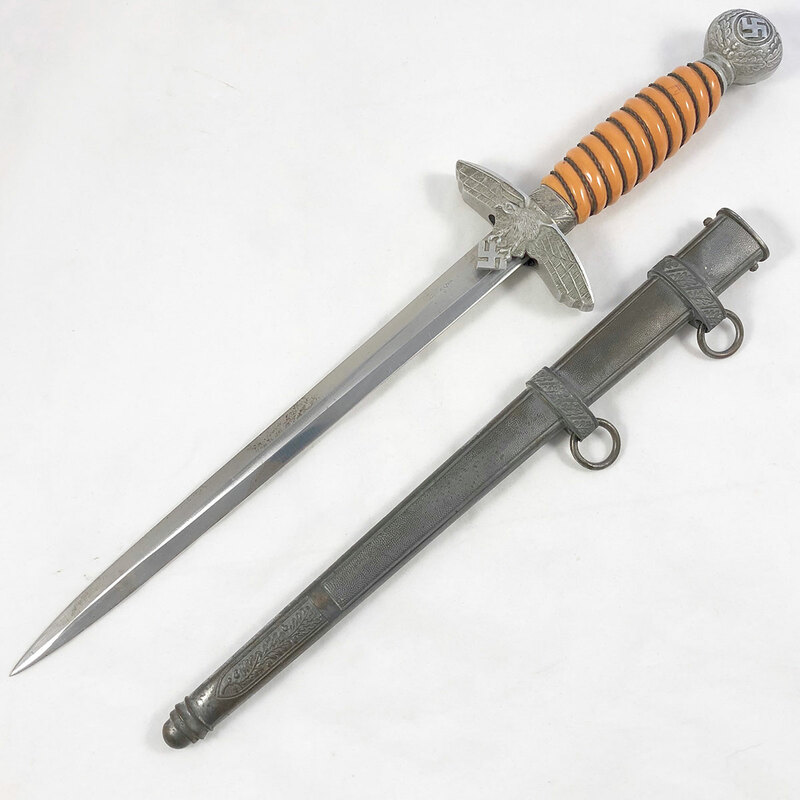 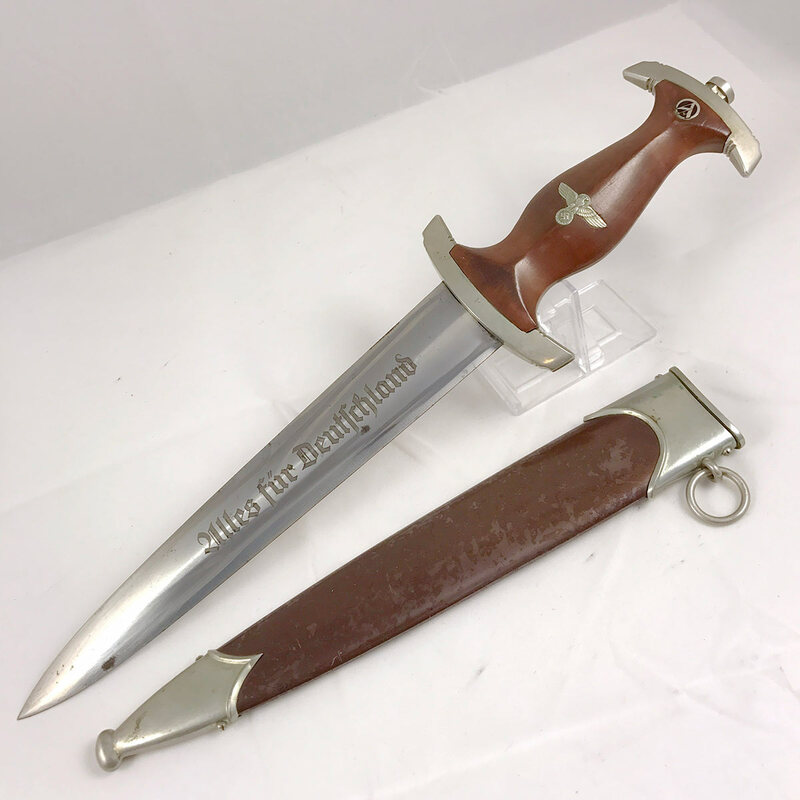 We have here a 2nd model Luftwaffe Dagger with the very desirable orange grip. 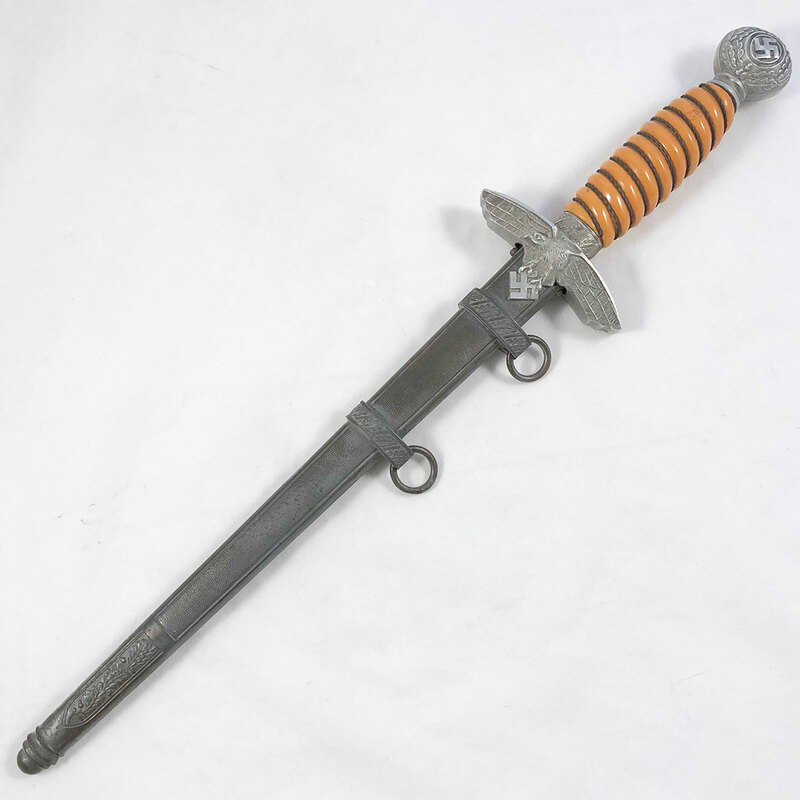 The grip itself is without cracks or chips, but there is what appears to be the letters “AH” hand carved into the front side near the top. 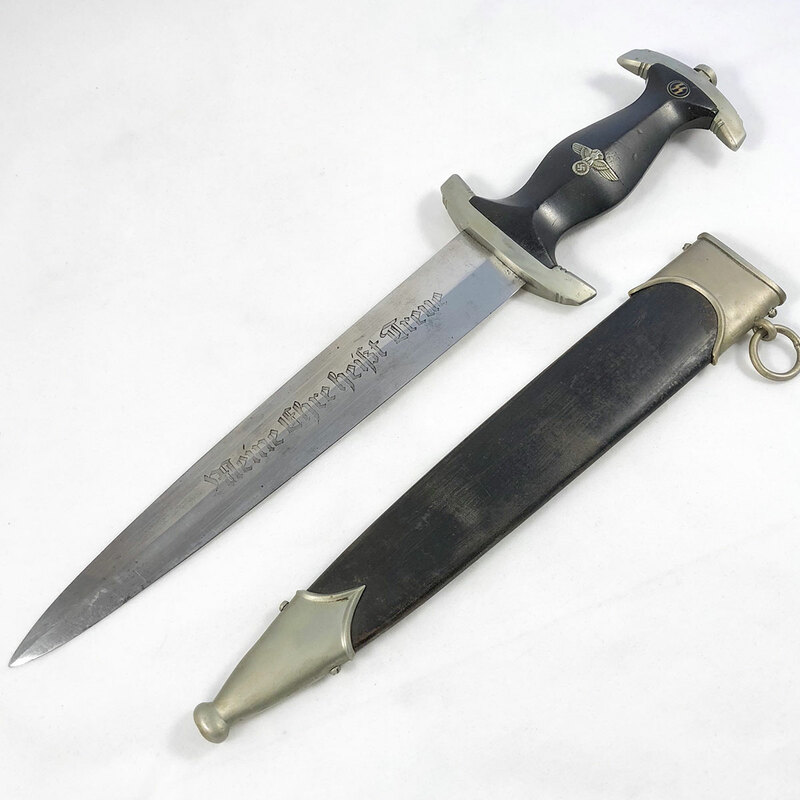 It is very faint, and likely put there by the veteran who returned it home from the war. 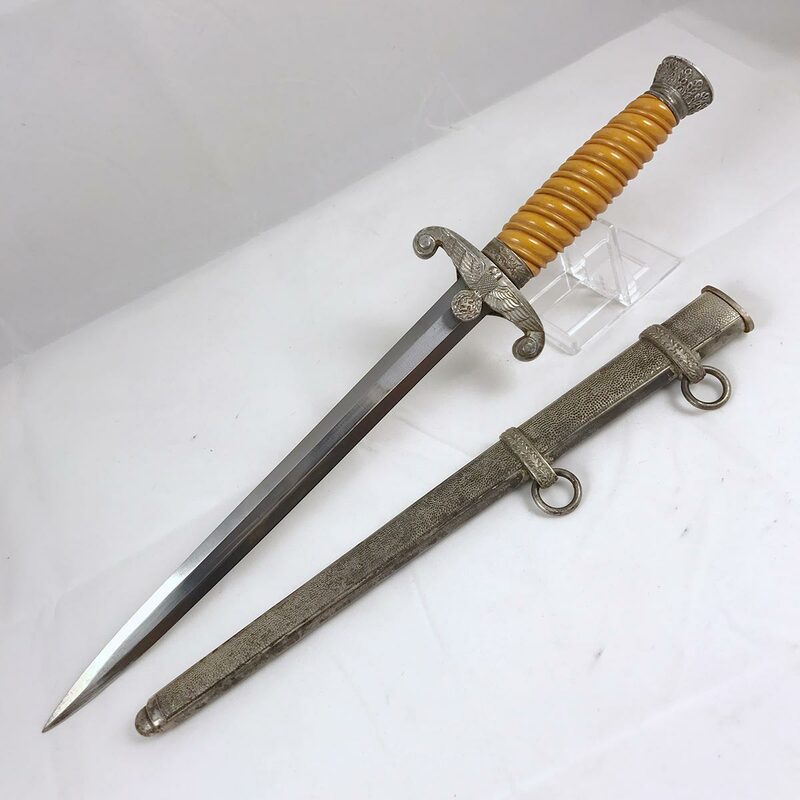 The grip wire shows a dark patina, and pommel cap is a little angled, likely due to a knock at one time that bent the tang. 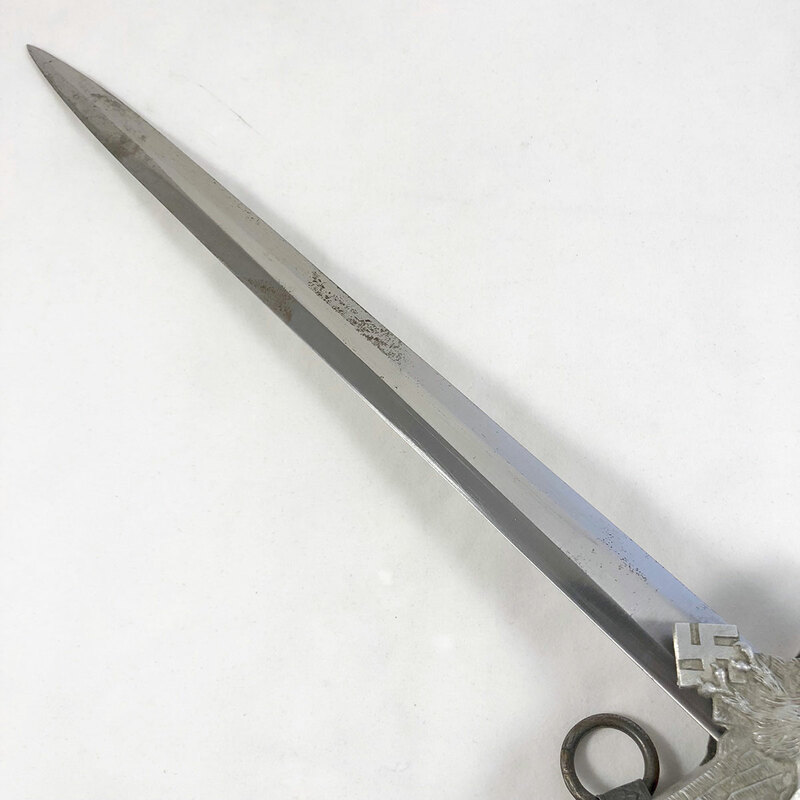 If you’re handy you may be able to bend it back. 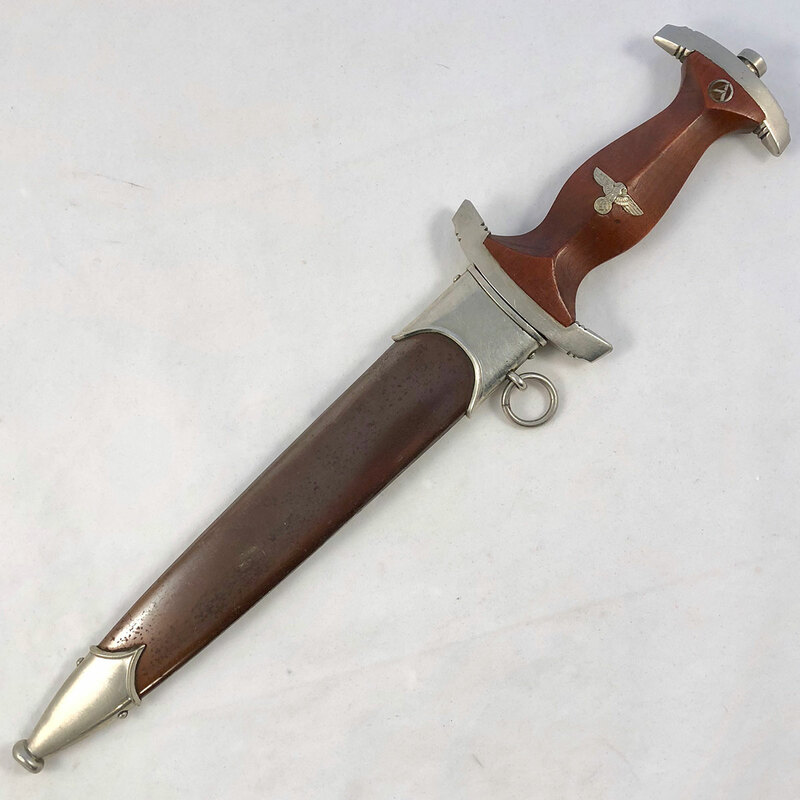 We did not disassemble the dagger to inspect. 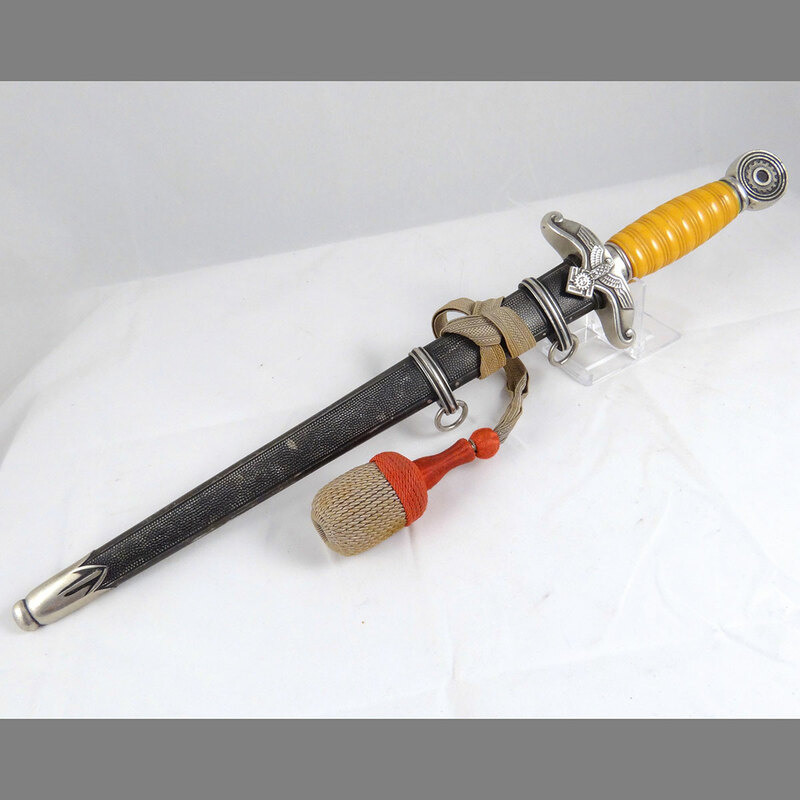 The crossguard eagle is very crisp, showing average age and use wear, but nothing notable. 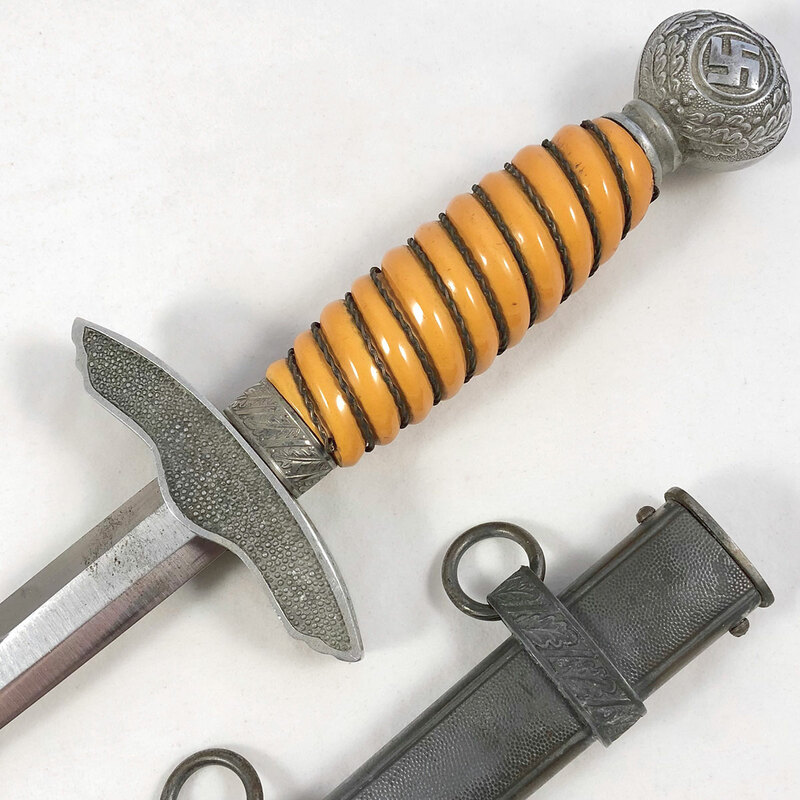 The crossguard (as well as the rest of the dagger) appear to be uncleaned, which is what we like to see. 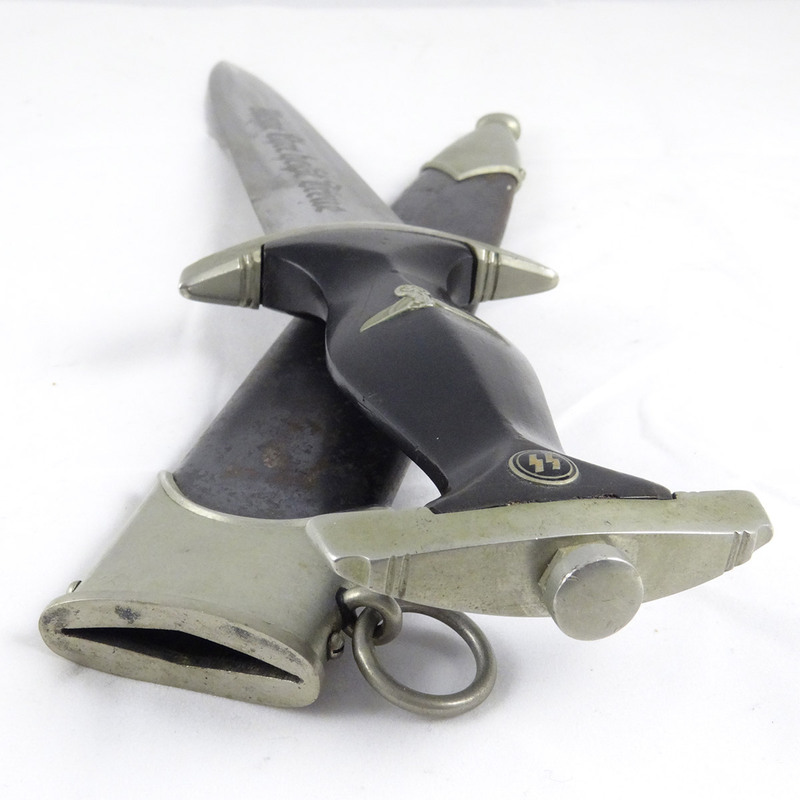 The blade is unmarked (no maker), which is common. 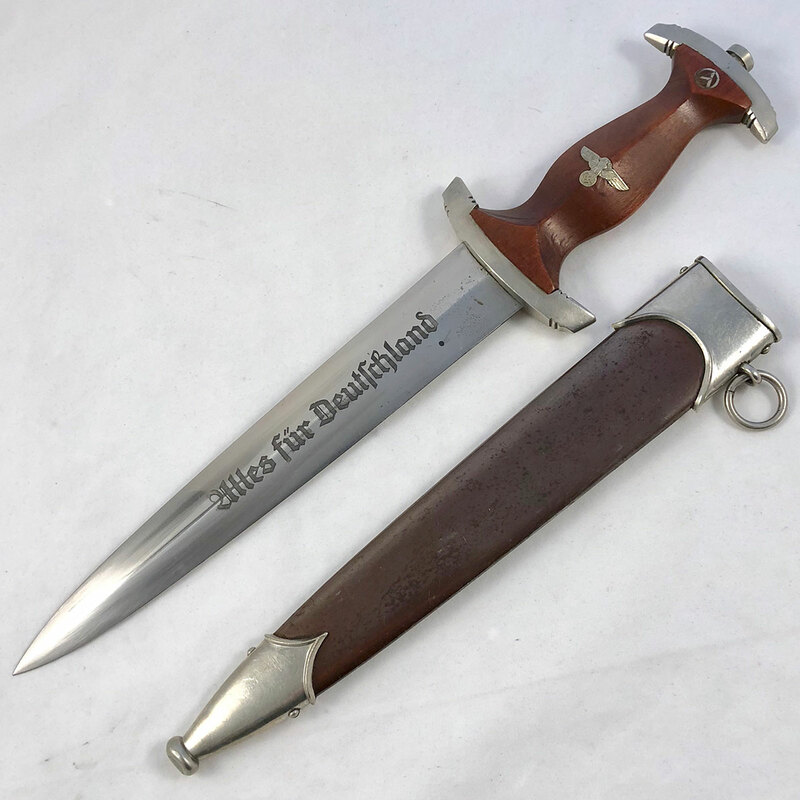 Not all Luftwaffe dagger blades were maker stamped. 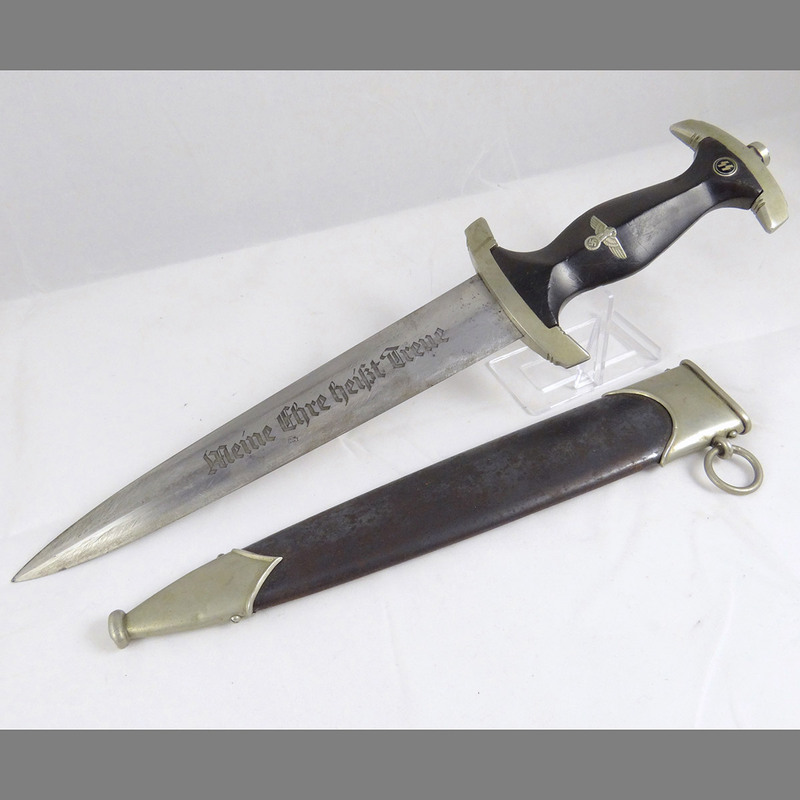 There are some minor oxidation spots throughout but otherwise the blade is in nice condition. 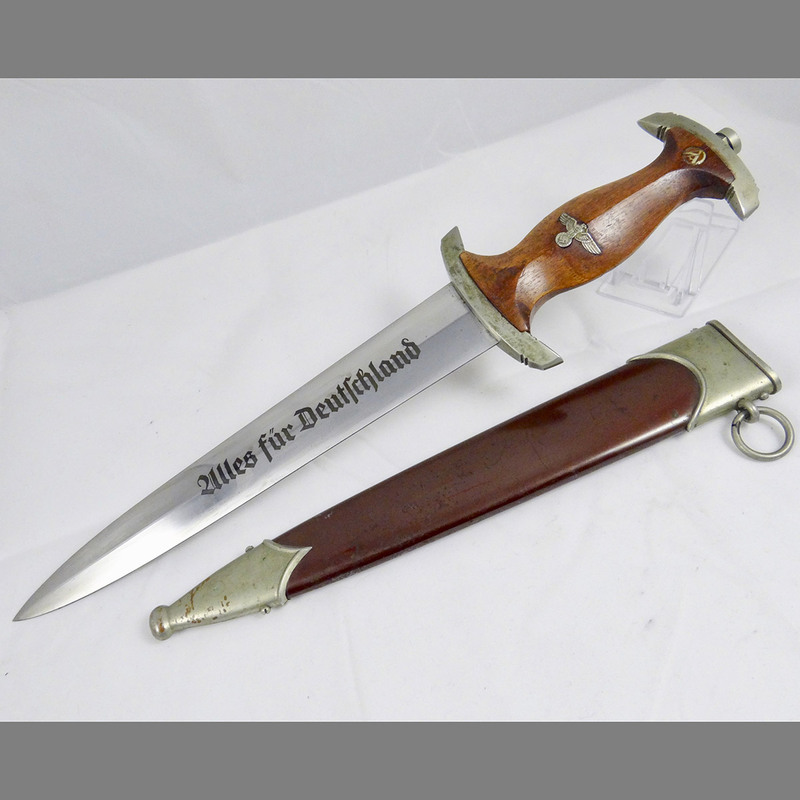 The scabbard shows the typical age coloring for this type of scabbard, but no dings or dents to report. 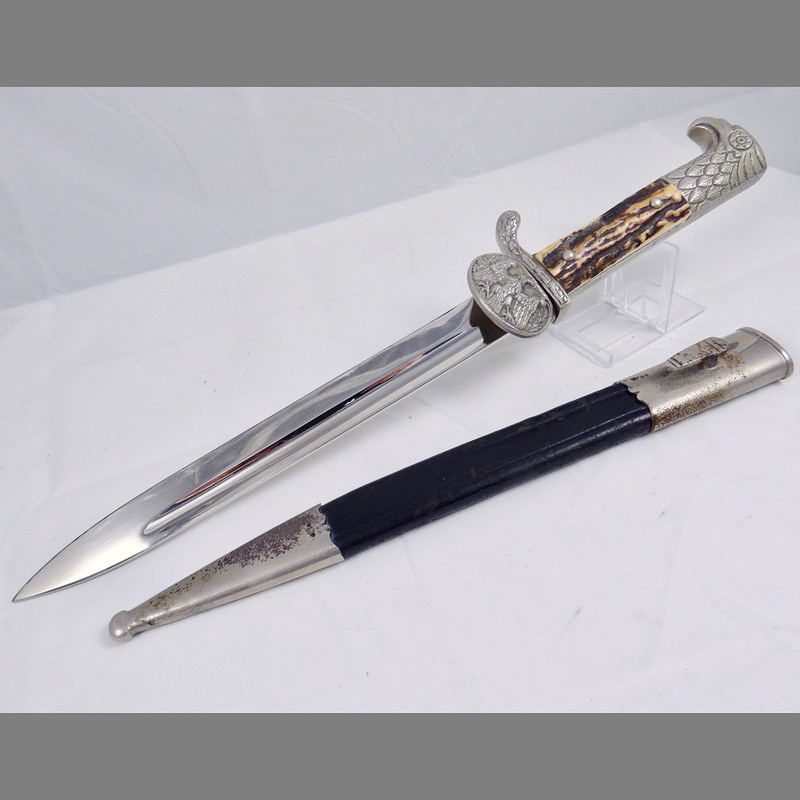 A very nice scabbard and dagger for the price. 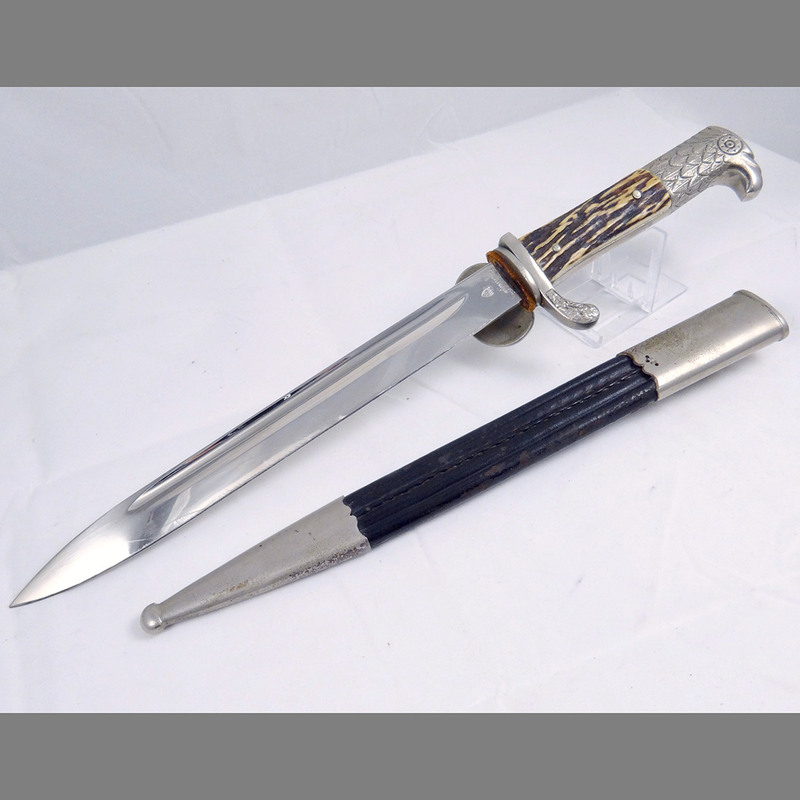 Here’s a budget SS dagger from a very desirable maker, and a Ground Rohm to boot! 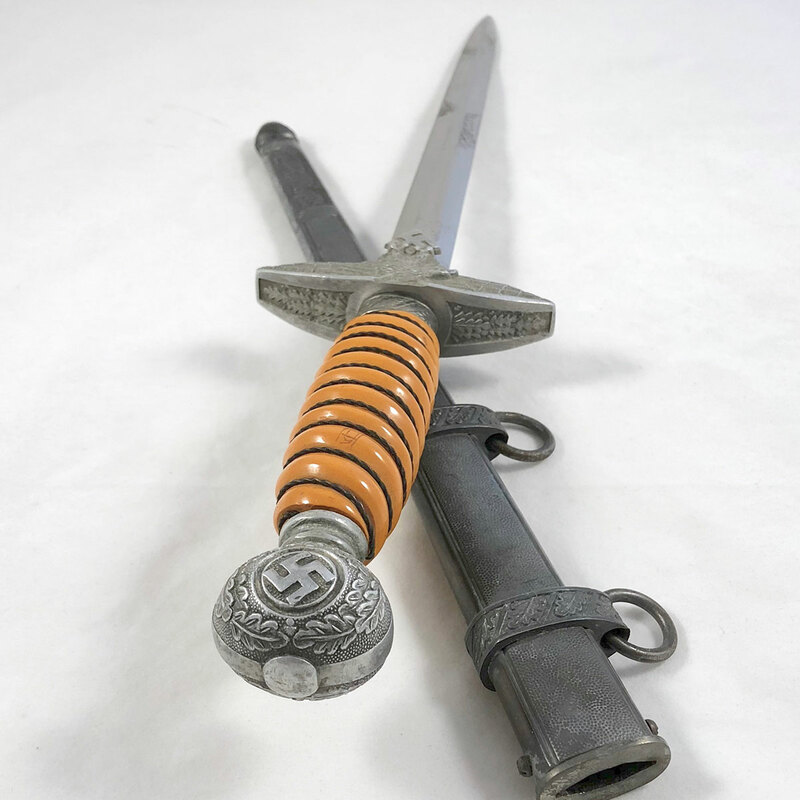 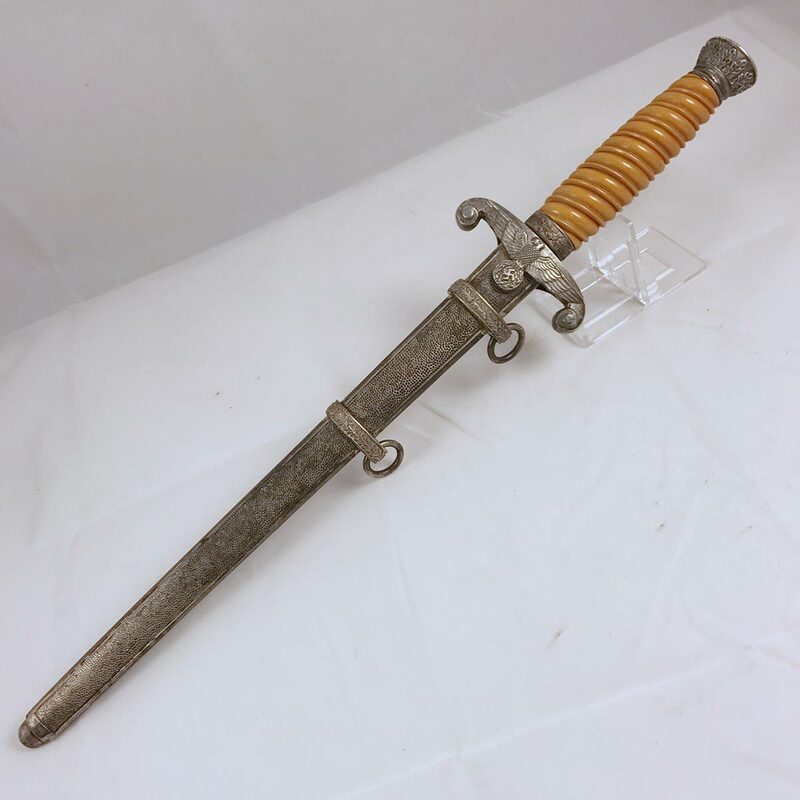 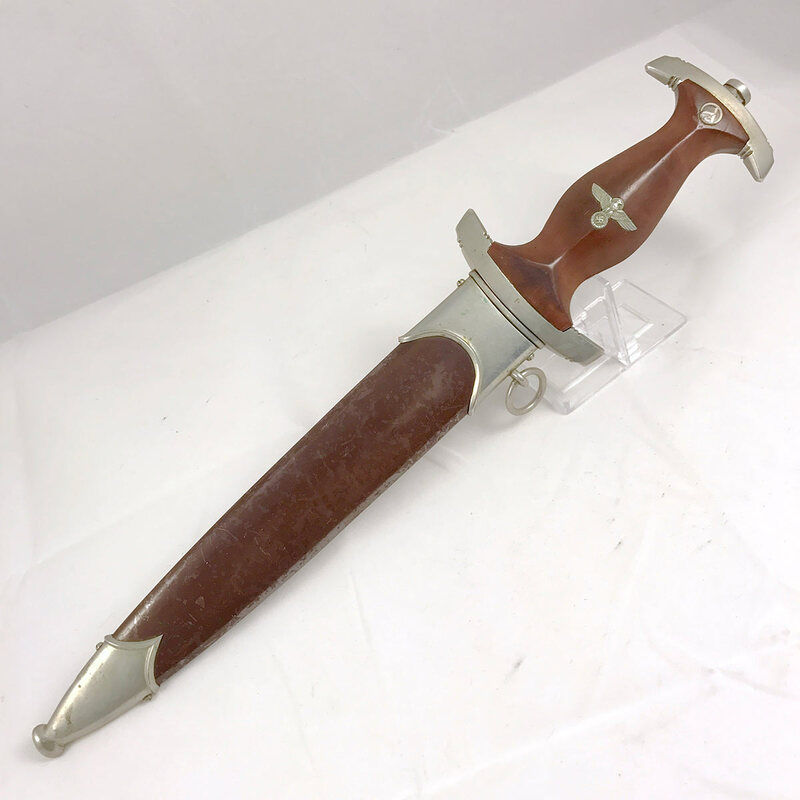 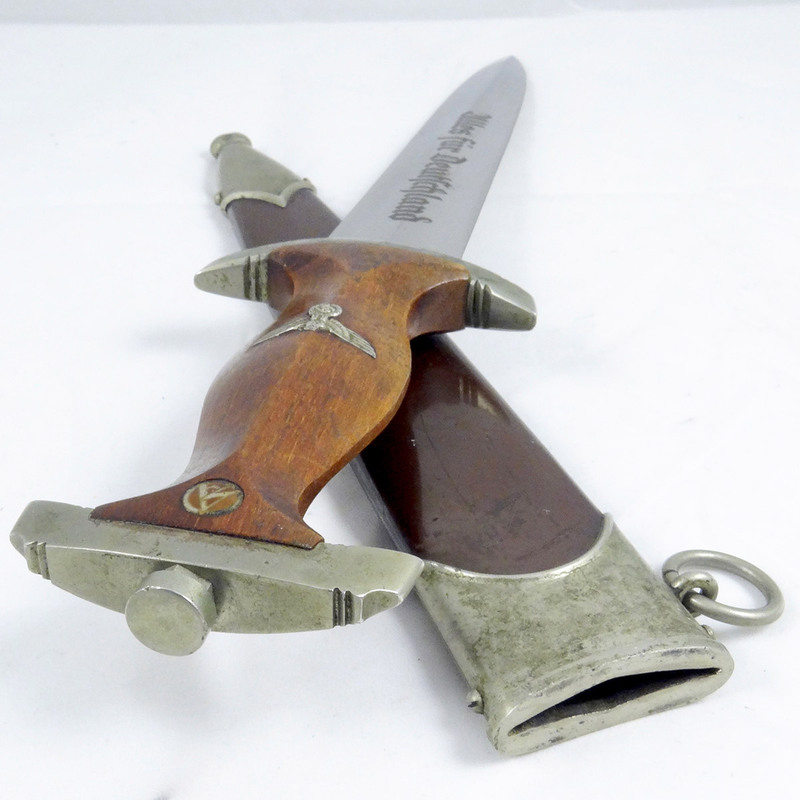 If you’re in the market for an SS dagger, but have a tight budget, this is your chance to grab one priced to see with a ton of character that displays well! 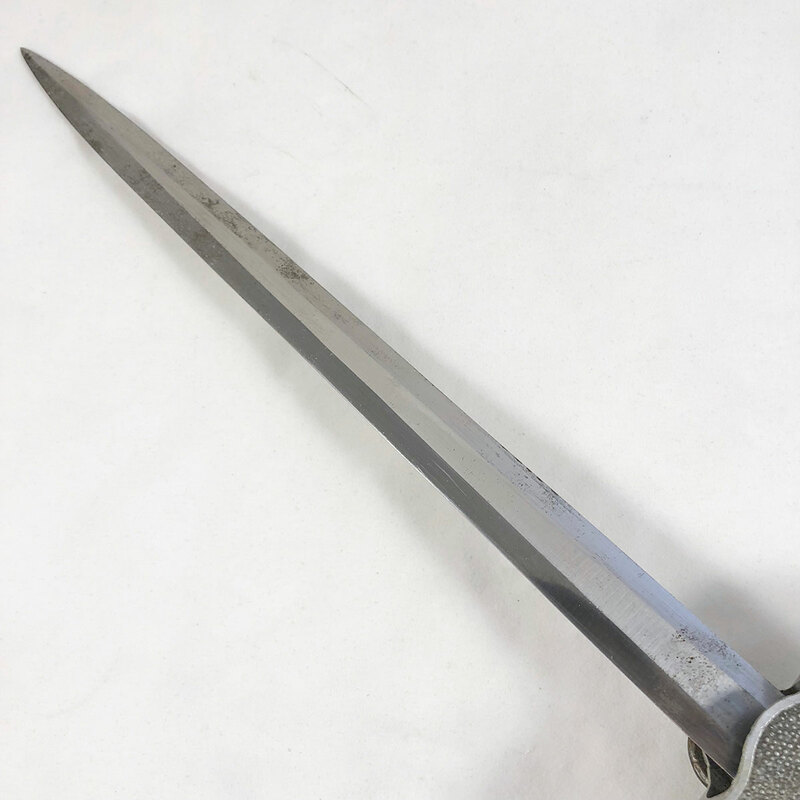 The grip is is excellent condition, with only minor dings and scratches.